In Parts 1 and 2 we covered an important aspect of the war being waged by George W. Bush & co. against the United States Military. In an accomplishment of prodigious magnitude, the neocons have succeeded at systematically destroying two precious and useful abstractions -- our reputation for invincibility and our reputation for taking the high moral ground. Today, both of these important images lie shattered. That consensus has dissolved. And the world - despite so much sacrifice -- is a far more dangerous place. * It gets even worse. But enough about image and reputation. Now let’s talk about the actual, day-to-day situation in today’s U.S. military. I have elsewhere addressed the declining state of US military readiness, offering -- for example -- a glimpse at the horrific condition of our National Guard and Reserves, whose principal task should be preparing for emergency service at home, or (at most) overseas in some dire and temporary crisis. Not to be hurled -- at presidential whim -- into lengthy and grinding foreign adventures or political wars. The devastation of our reserves, tearing families apart, breaking solemn promises and leaving communities defenseless, should be a major scandal. It certainly is part and parcel of the overall demolition of our military. 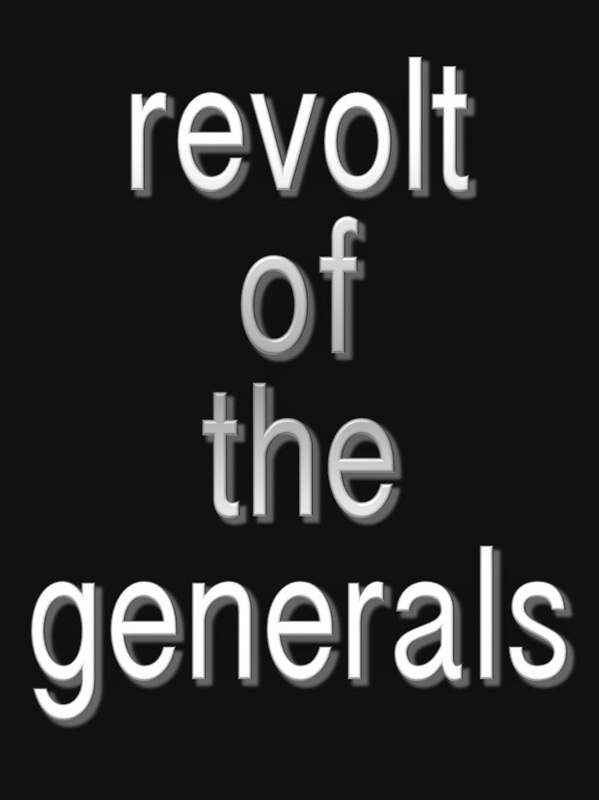 Now that the “Revolt of the Generals” is finally getting some attention, will journalists and mass media finally start doing their jobs, investigating and telling the stories America needs to hear? Or should we stop passing the buck and start looking in the mirror? Back when I first raised this issue, I never expected that the American people would let these horrific trends continue. But we have. Indeed, things are even worse. And, ultimately, the fault lies at our own feet. * America’s Plummeting Readiness for Real War. Two years ago, I spent a fascinating several days at Fort Irwin, in California’s Mojave Desert (to film an episode of my "Architechs" TV show) riding armored hummers and interviewing Special Forces sergeants. There, at the National Training Center, US Army Brigades used to assemble for large scale field exercises, practicing the art of full-force combat in order to hone the very skills that were used so effectively against Saddam’s huge military machine, both in 1991 and in 2003. These are the capabilities -- to fight large-scale land warfare -- that seemed so impressive to the rest of the world, that many potential adversaries seemed ready to admit that they would never achieve parity with such a formidable US Army. That was then. Today, no brigades come to the National Training Center, anymore, to forge their large scale war-fighting skills in fiercely realistic exercises. Now, small units arrive weekly to blitz in and out of fake Arab villages, simulating urban counter-insurgency tactics. In essence, we have turned almost all of the US Army into one giant SWAT team. Yes, it is an important modern skill. We need to invest in 21st Century counter-insurgency tools and doctrines. But have we forgotten that the principal purpose of the Army is to defend our nation from those who would wage real war against us? ....putting all of that aside, each of those divisions took on herculean labors for a month, demonstrating how much warriors can achieve, when their training, equipment, doctrines and morale are honed to a mighty peak. Only, now ask the officers and noncoms of the Third Infantry, or the Marines, if they feel ready to perform such miracles again, after four years rotating in small units, getting worn down as an occupation constabulary, re-taking the same dusty streets, over and over again, bleeding without apparent goal or purpose, for people who - to a large degree - just want them to go away. Are there any exceptions to this near-utter turn of the US Army away from training for war? Well, one brigade of the 101st and one of the 82nd are kept on standby, at a high level of readiness. But they are light, air-mobile forces... essentially SWAT teams in their own right. So, when it comes to heavy warfare, they don’t count. No. If you look carefully, we only have a couple of brigades that are ready, at this moment, to perform a heavy war-fighting role. And those are in Korea. That’s two brigades. Maybe three. Far away from home. * We Could Not Defend Our Borders Against Canada. Of course the preceding sentence creates an absurd image. Yet, it was inspired by something said to me recently, by a senior officer. Imagine what an issue this would be, if laid out, cogently, before the American people! Fortunately for the neocons, most Democrats and moderates seem unable to grasp the potential power of this scandal, transcending old definitions of left and right. Take the “two wars doctrine” that was prevalent throughout the 1980s and 1990s. Throughout his administration, President Bill Clinton was harshly criticized for maintaining a land force that would “only marginally” be ready to overcome two major regional challenges at the same time. .So, what are we to make of the consensus among U.S. generals, that our present land force could not even deal with one small or moderate surprise conflict? On land, that is. All indications suggest that the U.S. Navy is still in decent shape. Still training for wide range of contingencies. Still ready to fight for us. At sea, that is. “For Marines.. fighting such a war (in Iraq) for more than four years jeopardizes the skills essential to its core mission -- combat as an expeditionary force.” Indeed, taking this from a strictly realpolitik point of view, the Marines Corps is precisely the branch of service that should maintain high readiness levels, in order to project U.S. power as a matter of (hopefully well-considered and mature) national policy. That’s their mission. Only, they have been betrayed. And so have we. * Well, at least there is the Navy. At last, a part of this that requires only one sentence, given all that we have seen. Just this glimmer of hope. God bless the United States Navy. ...so where did all the words go? Jamais Cascio has just been musing on poor counter-insurgency measures as an auto-immune disease. As usual you are right on target. Or is he just positioning himself for his run after the next Democratic president sinks in this quagmire? After watching the orchestrated media attacks on the Iranian president's visit here I fear that this president who has been trying very hard to create a military confrontation with Iran may try to do so unilaterally. And unfortunately it will require many senior military officers to refuse or disobey orders to stop it. It runs counter to all of their training to do so. We have a military that believes almost unquestioningly in civilian command authority. This has saved us from military coups seen in so many other nation states in history. I read "Seven Days In May" in high school before beginning my short military career. I was certain during my time in the Army that the Officer Corp would never have participated in such an activity. I feel certain that that is the case today as well. However it also makes refusing orders from the civilian command authority just as difficult. For this reason it is imperative that Congress pass a resolution forbidding any military actions against Iran without the advise and consent of Congress. This will empower the military to say no. Tactically it is not a good move as it does limit our use of pre emptive action. But Iran truly is not an immediate threat to the United States. In fact their continued existence may be the only thing that stablizes the Middle East. Learner: For starters, Pat Buchanan is a viciously bigoted outright fascist. Nevertheless, he hums a sufficiently different tune to suggest that he is not another hired (or blackmailed) shill for Rupert Murdoch and the organized cabal. I have never seen him, for example, parrot exactly the same talking point phrase as TV’s Twenty Whores have done, on so many occasions that it’s comical. Moreover, he’s right that Iran’s President Mahmoud Ahmadinejad ranks pretty low on any list of those who have actually and physically harms the West or America -- so far. Indeed, Ahmadinejad is wholly the creation and creature of Condaleeza Rice, whose theatrical and impotent public saber rattlings seemed perfectly timed, over the years, to ensure Ahmadinejad’s election and then to rhythmically reinforce his grip on power. An aspect that Buchanan conveniently ignores. I agree with PB that the invitation for Ahmadinejad to speak at Columbia University was an act of strength and dignity on the part of America and especially New York, the world’s capital. That part went very very well, I think, and people were wrong to complain. Nevertheless, Buchanan is a putz for saying that New Yorkers were wrong to keep Ahmadinejad from laying a wreath at ground zero. That’s a different matter entirely. Everybody knows he’d be there to smile and be happy and to pose at the scene of death and misery. New Yorkers had a right to refuse him that pleasure. The crux Buchanan may not be a pure cabal shill. But he is a bona fide jibbering loon and deeply, deeply evil. As for an attack upon Iran: Well, it certainly seems to be what both Bush AND Ahmadinejad want. They are busy baiting each others’ populations in syncopation and with apparently deliberate glee. I agree that it would be hard for the military to thwart such an insane move as a presidential order to attack a nation with whom we are at peace, without even a fig leaf of sanction by Congress or the UN. Indeed, who can doubt that the Air Force will snap to and obey with elan Meanwhile, I hear reports that Naval officers who express doubts about administration policy are transferred away from front line duties, especially on carriers. Even if the Navy does prove much more resistant to bullying and intimidation by mad politicians, would they disobey direct orders from the CiC to load up bombs and fly them to Iran I expect there might be a work slowdown... a work-to-rule resistance. Perhaps a catapult or two might go out. But no. One carrier would not leave the pilots from another in the lurch, to fly into hostile territory without backup. So I guess they all would fly. Would the bombs hit actual targets Well, I have mixed feelings. If we DO hit Iran, I do hope the nuke separators are taken out effectively and permanently. And yet, all the really important gear is buried deep underground, I hear. And a clearcut patter of misses, surrounding a politically motivated target, would certainly send a clear message. Never mind. Resisting such a blatant move, that we see so clearly in advance, should not be the JOB of our servicemen. It is OUR job. Lerner is right that Congress should act asap. Possibly, a mere resolution can pass in the Senate without requiring 60 votes. Still, the Iran scenario is not my biggest fear. It would distract America, but also show starkly what Bush has doen to the military. His popularity would plummet even farther. No, I fear a surprise. A bona fide nasty piece of work, aimed at terrifying us all. Do drop by and boost my numbers!